A responsive website is one that changes its layout and/or design in response to the size of the screen on which it is being viewed. Screen sizes have become much more varied in recent years with desktop PC's and laptops increasing using wider displays and the advent of smart phones and tablets meaning that people are also looking at websites on much smaller screens. It is almost impossible to have a web page with a static design that is both easy to read and use and also looks good on all screen sizes. Most web pages at the moment have been designed with desktop or laptop screens in mind are are often too small to read properly on a mobile screen without scrolling right in. In the past businesses have often tried to solve this with a mobile specific site but this leads to an increased amount of work in promoting the site and adding/changing content. Responsive site are considered to be increasingly important to fully take advantage of the increase in visitors your website can get from mobile and tablet users. The search engines such as Google also regard responsive sites favorably and have started to reflect this in their rankings and advertising programs. 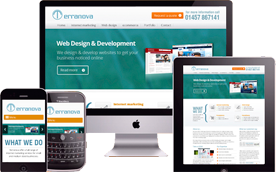 Terranova can design your website to be responsive. We can also redesign an existing site to make it responsive. Our general approach is to have one design for larger screens which shrinks down until the screen size gets below 800px wide (just above the approximate width of a tablet in portrait), then the design is slightly simplified to ensure it's easy to use and read on tablets or with smaller screens in general. Once the screen size gets below 480px (i.e. a mobile screen) we have a third design which keeps all the content in a single column and uses a drop-down menu to make it easy to read and navigate without the need to scroll in. This website is responsive so to see how this works in practice visit us on your mobile, tablet and desktop computer and see the difference. So when we make a responsive website for a customer, you will receive three different designs rather than the usual one. We'll discuss with you the most important messages and aspects of the site to ensure your most important content is prominent on the page no matter how it is being viewed. For a responsive design for a new website we are making we charge an addition 75% of the web design price. If you already have a website and would like us to implement a responsive design, please get in touch so we can give you a quote.